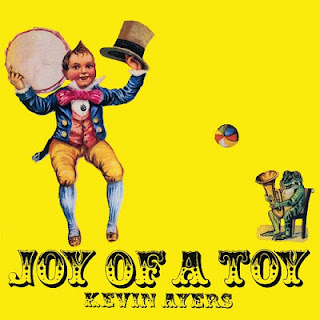 Kevin Ayers was a big admirer of Syd Barrett, and when he was about to record the catchy Singing A Song In The Morning, a.k.a. Religious Experience, he paid the Floyd eccentric a visit. Ayers invited him to add some of his trademark guitar magic, to which Barrett agreed, and on the 28th of November, 1969 the madcap duly appeared at Abbey Road studios. Alas, the producers thought Barrett's contribution was too uncommercial for release (nonsense of course) and the song too long (quite right). Subsequently, the take was never officially released until the cd remaster of Ayers' first album away from Soft Machine, Joy Of A Toy, appeared a couple years back. Singing A Song In The Morning was eventually re-recorded and released as a single, with the religious experience bit erased. Take your pick below, ladies and gentlemen.